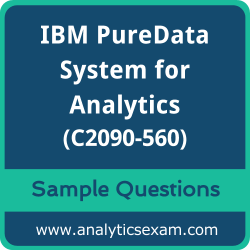 Here are the sample questions which will help you be familiar with IBM Certified Specialist - PureData System for Analytics v7.1 (C2090-560) exam style and structure. We encourage you to try our Demo IBM PureData System for Analytics Certification Practice Exam to measure your understanding of exam structure in an environment which simulates the IBM PureData System for Analytics v7.1 Certification test environment. To make your preparation more easy for IBM PureData System for Analytics v7.1 (C2090-560) exam, we strongly recommend you to use our Premium IBM PureData System for Analytics Certification Practice Exam. According to our survey with certified candidates, you can easily score 85% in your actual IBM Certification exam if you can score 100% in our premium IBM PureData System for Analytics Certification practice exams. 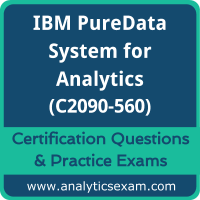 Pass IBM PureData System for Analytics (C2090-560) Certification exam with our premium practice exam. With tons of experience in the field of IBM analytics, our expert panel has designed this practice exam which completely simulates the IBM Certified Specialist - PureData System for Analytics v7.1 exam pattern and format. We at AnalyticsExam.com, have maintained exam structure, time limit and marking system same as IBM Certification. Our experts have included more practical questions which are the most frequently asked in IBM Certified Specialist - PureData System for Analytics v7.1 Certification.